Well, there is a lot going on around here, and with a new part time job, a house abuilding and a family who have their holidays at this time of year I’ve been busy. But so has Charlie and I’ve had a number of people asking what he is up to. So here we go. The engine's systems are mostly completed, exhaust and water trap muffler, cooling lines, fuel tank and filters all complete. There is still the electrical system to go, but the battery box for the engine battery is almost finished, and the toolbox is nearly done as well. 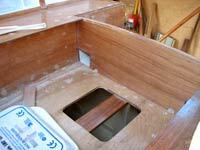 The woodwork in that area has been fiberglassed and painted where needed, primed with epoxy primer elsewhere and the beginnings of the companionway steps under which the engine will hide are there as well. The cockpit floor, seat fronts and seat tops are in, and the big locker at the after end mostly complete. That locker, essentially a continuation across the after end of the cockpit of the locker has become known as the “smellies locker”. It drains out into the cockpit footwell and from there out the cockpit drains so its not possible for spillages to go below so fuels such as kerosene, methyladed spirits (fuel alcohol) and paint thinners will be safely stored there. 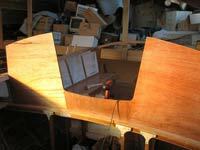 The cockpit footwell is all fiberglassed to prevent wear or leakage, and the hatch that has been selected for the cargo hatch opening in the after end is a very solid one that will cope with foot traffic without leaking. The cargo hatch is aft of the watertight bulkhead just behind the engine bay, and it will hold a good amount of odds and ends, mostly items like awnings and spare water containers, handy space to have in a long range boat. We have put access holes in the main cabin after bulkheads so long items can be stored inside the cockpit seat coamings. 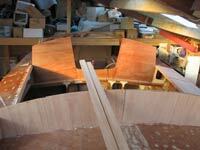 Oars, fishing rod, spare lumber, rigging spares and such, up to about 2m long; another handy space. Charlie has the decks all complete, two layers of 6mm plywood laminated over frames and stringers and fiberglassed with 10 oz triaxial glass cloth; you could dance a jig up there without any movement at all. Solid as a rock and very reassuring to walk on. At each end of the main cabin the bulkheads are up, the forward one has another part bulkhead to go on ahead of that, it forms the deck boxes and dorade vents as sell as bracing the mast tabernacle and cabin top, we ran an eye over the cabin with Charlie in there the other day and pulled the cabin top down a little to reduce its height, enough headroom is enough headroom and as long as it clears his hat while he is standing up that’s plenty. In the same area there is a couple of big laminated beams to ensure that the mast step is well supported, and that in the case of a dismasting the damage is likely to be confined to the above decks area and keep the cabin structure intact and watertight. 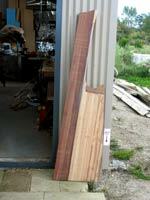 Steering the boat requires a rudder, and the rudder blank has been made up, a mixture of Australian Jarrah hardwood and kauri with bolts from one side to another its big, heavy and very strong. I don’t want to see this break and if anything I have over designed it, there are big hardwood cheek pieces to go on it yet and that odd little styling device at the op of the blade is actually there for a reason. 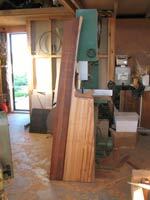 It provides a place to put a foot when climbing aboard, it will be drilled to take steering lines if the tiller is broken or out of action, and the hardwood insert greatly reduces the likelihood of the rudder blade being split. At the foot end of the rudder there will be a “wing” or end plate, which like a lot of other features is there for more than one reason. It will improve steering, and provides a place to put a foot when beginning the climb on board for a person in the water. Fittings and rigging items continue to arrive, parcels a couple of times a week and the shelves are filling up with gear. 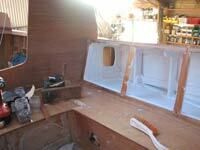 Its feeling as though the build is in the finishing straight, lots done and the jobs to be done are getting smaller .